The YES! Weekly Blog: Ignite High Point Whistle Stop Concert Series: The Rad Trads Friday, June 17 6-8 p.m.
Ignite High Point Whistle Stop Concert Series: The Rad Trads Friday, June 17 6-8 p.m.
"This FREE, Friday concert series at High Point's beautiful, historic passenger train depot wraps up tonight. Based in New York City, The Rad Trads have quickly gained a reputation as one of New York's most entertaining live acts. 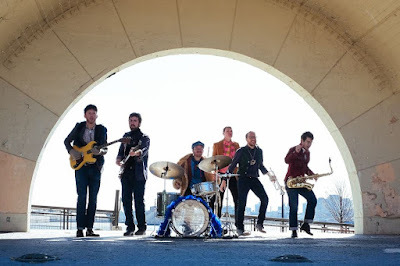 They bring their love of the game to a diverse style of soulful American music, with influences ranging from early jazz to New Orleans brass band, R&B, the Chicago and delta blues, and rock & roll. Featuring three powerful horns, a driving rhythm section, and three captivating lead vocalists, The Rad Trads consistently win over audiences with their relentless energy, charisma, and enthusiasm. Recommended for fans of: Holy Ghost Tent Revival, Rebirth Brass Band.